Last week we looked at actors who ride onscreen and off. This week we'll look at the actresses who can also be found in the saddle when they're not on the set. Fanning's riding career began with the filming of "Dreamer," the film about a racehorse's career-threatening injury and the girl who refuses to give up on her. 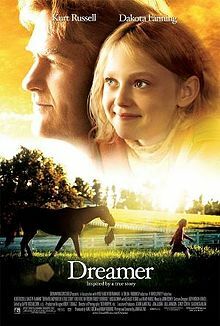 Actor Kurt Russell played Fanning's father in "Dreamer," and it was Russell who gave Fanning her first horse – a palomino named Goldie. Fanning underwent weeks of riding lessons to prepare for the movie, and now owns her own horse as a result. Sheridan began riding when she was only three years old, so when she had to play an inexperienced rider in "Honeymoon For One," she truly had to draw on her acting skills. Sheridan picked the aptly named Star, the grey horse she worked with in the film, and owns multiple horses which she keeps at her a barn at her house in California. Sheridan's also involved with Ride On, a charity which uses the healing power of horses to benefit disabled children and adults. Teri Hatcher has gotten into the saddle because of her daughter, Emerson Rose, who loves horses. Hatcher's "Desperate Housewives" co-star, Nicollette Sheridan, has been teaching her and Emerson Rose how to ride during their time off from filming. Actress Alyssa Milano grew up with horses. Her father owned many of them, and Milano learned to ride at a young age – a passion which would follow her through her later life. An all-around animal lover, Milano first bought her horse when she was working on the CW series "Charmed," and now owns seven horses. Blair rocketed to stardom for her role in "The Exorcist" when she was only thirteen. Prior to acting, Blair was a competitive rider, and she has since continued to ride and compete. Blair rides, trains, and competes with jumpers, but does so under a pseudonym for her privacy. These women aren't just talented actresses – they're talented riders as well. This entry was posted in Horse Shows. Bookmark the permalink.